Do you know how to optimize Twitter? Now that you’re on, it’s time to start optimizing Twitter. What are lists on Twitter? You may have noticed people who have a rather different follower to following ratio than you do. What do I mean by that? Let’s say you follow 100 people. And 1000 people follow you. The ratio of follower to following is 100:1000, or 1:10. This is fantastic. Celebrities often have ratios that look like this, or even better, where they might be following 100 accounts but there are 100,000 people following them. Newbies often end up at the other end of the spectrum, with 1000 people they are following and 100 are following them, for 10:1. If you want to just read for the most part, this is perfectly fine, except it doesn’t mark you as a thought leader. Now, most people don’t sit down and calculate ratios. But they do glance at profiles. Sir Patrick Stewart, for example, might be following some 200 people but he’s followed by 2,000,000. Hence people will really notice if he starts following them. Does he (or any other celebrity, major or minor) have a sparse news feed? Probably not. Because he might be using lists. Go to the profile of someone you want to follow but, instead of hitting follow, pull down on the gear wheel and select Add to or Remove from Lists. Your lists will show up, and you can add someone to several at a time, or make a new list. You can even decide whether you want your list to be public. Go to your own profile (e. g. click on your profile rather than your settings) and you’ll see whose lists you are on. Why use a list rather than follow? You’ll still see that person’s tweets in your feed, but your ratio won’t change. Furthermore, a public list tells everyone what you’re interested in. How about lists for indie authors, agents, or publishers? You can also follow others’ lists. Maybe someone will find yours to be definitive and will follow it. Sometimes you want to publicly follow someone, rather than add them to a list. So long as you keep these people special, then this is perfectly great. I tend to keep friends as open follows and anyone more business-related on lists. But you may prefer otherwise. Follow fellow indie writers (this is a community, after all), or publishers, or agents. Consider who can help you, and who you can help, and follow accordingly. What’s a hashtag, and how do you make one that isn’t lame? A hashtag is a means of searching on Twitter. Hashtag something as, say, #amwriting, and click on that, and you’re led to a slice of Twitter of everyone who used that hashtag. Hashtags don’t look good if you use a ton of them. Don’t just indiscriminately hashtag! Also, keep them short. #ILovePuppiesAndDolphinsAndUnicorns is probably not going to be something used by anyone else, or at least not that frequently. But #ILovePuppies is pretty popular. Experiment by searching before you hashtag. 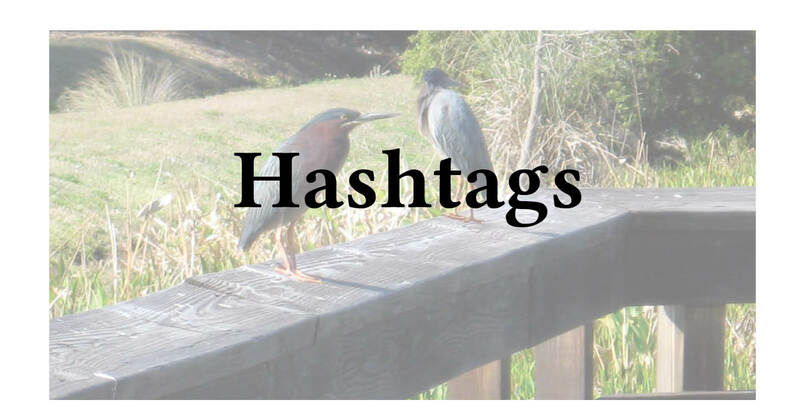 Beware, your innocent-looking hashtag might already be coopted for an unexpected usage. Just do a search on #NeverForget or #IStayedBecause and you’ll know what I mean.